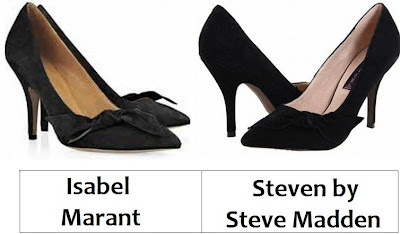 Dolls, to the left you will find Isabel Marant’s perfect Poppy Bow-Embellished Suede Pumps in Black Suede – the very same ones seen donned by Hilary Duff, Elle MacPherson, Kate Bosworth, Anne Hathaway, Katie Holmes, and Lisa Snowdon; to the right you will find Steven by Steve Madden’s fabulous Fluttr in Black Suede. Though Fluttr sports a slightly lower heel (4”) than the pretty Poppy (4 ½”); for just $83.99, as opposed to the $620.00 needed to scoop up a pair of the magical Marant’s, they allow the frugal fashionista to slip on a bit of star style – at a price that won’t make your AmEx cringe! 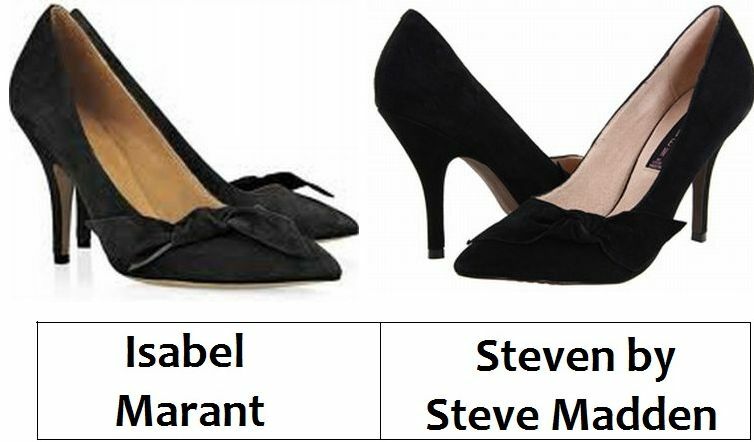 Tell me, kittens…will you be a big spender and go for Isabel Marant, or be thrifty and spring for Steven by Steve Madden? I'm happy to hear about Isabel Marant! Thank goodness for Isabel Marant. No way, could I afford those other shoes. What a beautiful shoe! I think I'll have Isabel Marant in mind these days. Awesome find! So glad you posted about these shoes! for that price, steve madden for sure! I like the look of those pumps, they have a very classic style. I'd go with the Maddens today. I actually like the Steve Madden ones better because the suede is darker! Wow, those are so expensive. The Steve Maddens. I'm glad there is a cheaper version. Maybe its best if I just look at them in the store window. I'd go for the flutter, then I could save money to buy more shoes! I love these shoes Erika, so pretty and fem! oooooh! these heels are so adorable!! i would totally wear them! i love the fact that they're suede, too! so pretty! Ah! You haven't done one of these in a long while. Love them! Steve Madden is awesome. Love the kitten heel on these. I really like the Steve Madden Fluttr pumps. They're adorable, plus they're a great price. I love Steve Madden shoes! They are always gorgeous and beautifully made. And the price can't be beat! Ooooh I love the Steve Madden alternative. I like Isabel Marant, but never enough to pay the inflated prices for her shoes. What a lovely find -- so ladylike and chic! great pointy toe heels for the spring! Well, Steve Madden certainly looks better this time when put side-to-side like that. I like it darker. But I can tell the sole of the Marant's seems to be better. I actually like the Steve Madden ones more. I like the darker shade! The Amex needs a break, sadly! I think I'll have to opt for the Fluttr! Steve all the way!! Love this comparison!! So pretty. I love the Steve Madden ones. oh i love these posts! i enjoy seeing the difference between the prices. Haha. they look so alike. So classy, I love them both! Steve Madden knows his shoes! Love. I have to say I love the steve maddens!